Tokyo– Immediately after explosions at the Fukushima nuclear plant in March, the Chubu Electric company put up posters at busy train stations near their controversial seaside reactor in Hamaoka, upwind from Tokyo on a dangerous fault line near the Mount Fuji volcano. The posters, trumpeting the virtues of nuclear power, surprised thousands of people fleeing increased levels of radiation in Tokyo and other areas. A few weeks later, some of the largest demonstrations in Japan in 40 years demanded the shutdown of Chubu’s five reactors at the Hamaoka plant in Shizuoka prefecture. Now, two months after tsunamis destroyed reactors in Fukushima, Chubu Electric has agreed to accept the government’s order to shut down the Hamaoka reactors, but only for a few years while it builds a seawall to “protect” its reactors from potential Pacific Ocean tsunamis. In making the shutdown order on Friday night, Prime Minister Naoto Kan cited Science Ministry predictions of an 87 percent chance over the next 30 years of an earthquake larger than 8.0 magnitude striking the Tokai areas including Shizuoka and Aichi prefectures, Japan’s automotive heartland. On Monday he praised Chubu’s decision, and promised to help Chubu avoid losses and power shortages while it improves safety measures. Many governors across Japan asked on Monday why the government is only shuttering the Hamaoka reactors instead of plants in their prefectures. Many observers are also questioning whether any wall, no matter how high or wide, can really block out the Pacific Ocean, which spawns tsunamis devastating Japan roughly every 20 years on average. On March 11, a 400-mile long mountain of water, racing across the Pacific Ocean at jet speed, easily surmounted, went around or blew apart some of the world’s strongest and most expensive sea walls, near the ports of Kamaishi and other cities. In Minami-Sanriku and Rikuzen-Takata, sea surges more than 40-feet high obliterated nearly everything in its path, pulverizing concrete buildings and mangling structures made of steel even 3 miles inland. Tokyo University researchers even found that the tsunami in Miyako city ran up slopes to a point more than 110-feet above sea level. Japan’s seismic experts have been opposing the Hamaoka plant even before construction began in 1971. In 2004, professor Katsuhiko Ishibashi, a former member of a government nuclear safety panel, called Hamaoka the most dangerous nuclear plant in Japan. Seismologists point to Dec. 23, 1854 and the 8.4 magnitude Ansei quake and tsunamis, which destroyed much of the Tokai area in Shizuoka prefecture from Numazu to Hamamatsu cities, which flank Omaezaki, currently site of the Hamaoka reactor and about 80,000 people in a 6-mile radius. Scientists believe that tectonic movement along the same subduction zone caused the 1923 Great Kanto quake, which spawned 12-meter high tsunamis near Tokyo and Yokohama, and two quakes and tsunamis in the 1940s. Due to war-time suppression of information, little is known about the Dec. 7, 1944 Tonankai tsunami’s effect on the Hamaoka area. The United States Geological Survey’s website says the 8.1 magnitude quake, felt across Japan, damaged 73,000 houses and killed at least 998 people, at a time when Japan’s population density was roughly half of current levels. 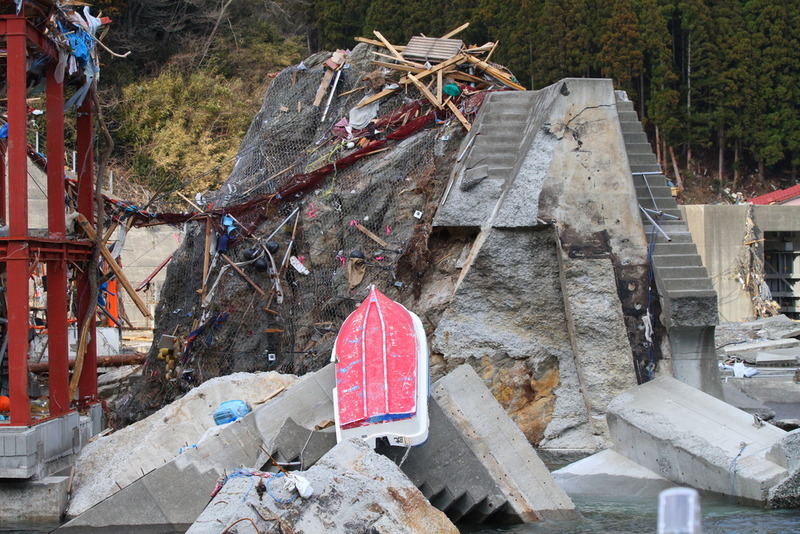 A tsunami up to 8 meters high devastated the Pacific coast from Choshi northeast of Tokyo to Shikoku island near Osaka. The Hamaoka reactor, only a few yards from the ocean, sits roughly in the middle of that 1944 disaster zone. Two years later in 1946, the 8.1 magnitude Nankaido quake, with 6-meter high tsunamis, killed at least 1362 and washed away homes roughly in the same area, according to the USGS. Since the March 11 disasters, Chubu Electric officials say they’ve drawn up plans to install more backup generators and build a 40-foot-high (12-meter) seawall nearly a mile (1.5 kilometers) long over the next two to three years. “Firmly implementing measures to strengthen safety would become the cornerstone to continue safe and stable nuclear power in the long-term and in the end lead to the benefit of our customers,” Chubu President Akihisa Mizuno told a news conference at its headquarters in Nagoya. The Hamaoka plant provides power to half of the 18 plants that make Toyota vehicles in Japan and all four of Suzuki Motor Corp’s domestic car and motorcycle factories, Reuters reported. The coverage area also includes auto plants of Honda and Mitsubishi Motors, as well as Sharp’s Kameyama LCD factory and Toshiba’s Yokkaichi semiconductor plant.